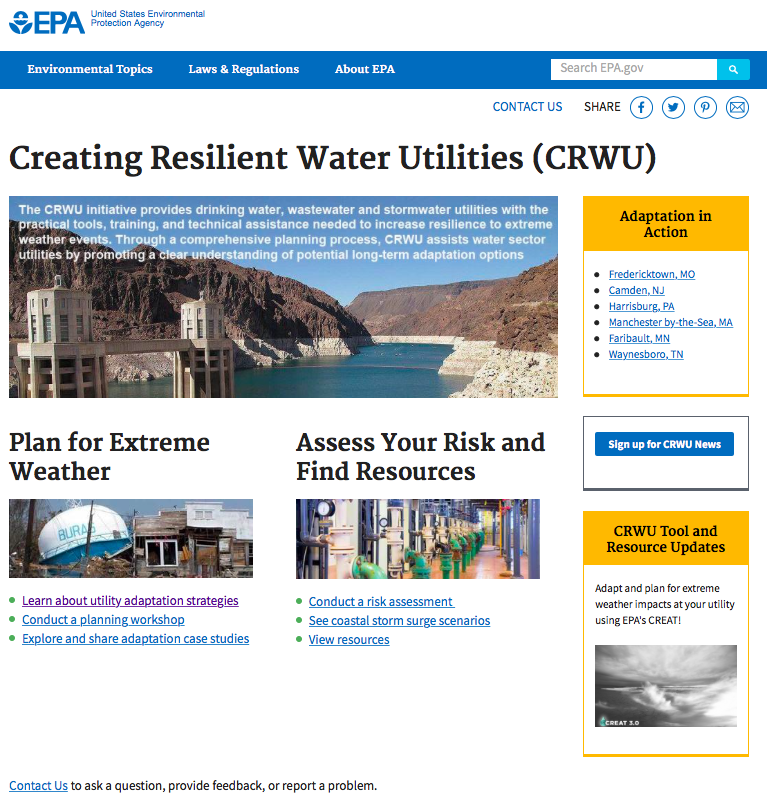 The Creating Resilient Water Utilities (formerly the Climate Ready Water Utilities [CRWU]) Toolbox is an online compendium of climate-related information useful for water sector practitioners. Resources are categorized into one of the following groups: publications and reports; case studies; workshops; and adaptation strategies. Users can also browse region-specific resources through an interactive map, or query specific resources according to different types of water resources, climate change impacts, and/or responses. The database is updated frequently, and can be used by a variety of audiences in various stages of adaptation planning and implementation. Example in use: Orange Water and Sewer Authority (OWASA) in North Carolina regularly uses CRWU to improve the resilience of their water provisioning, water reclamation, and stormwater services. Along with participating in regional conferences and meetings, CRWU has increased OWASA’s exposure and access to cutting-edge and unique water management solutions in the face of climate change. OWASA is now applying many of the tools and resources available through CRWU, and is also involved with the continual expansion and updating of this online information portal.